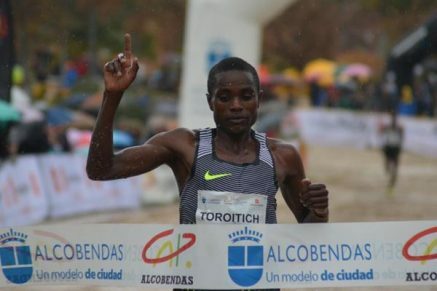 27th November 2016 – Once more Timothy Toroitich (UGA) showed himself to be the master of the Spanish cross-country circuit as he took victory at the 35th Cross Internacional de la Constitución, the second leg of 2016-17 IAAF Cross Country Permit series. This was his second success in eight days and his fourth consecutive podium finish at this event in the outskirts of Madrid. On a course mixed with rain and mud, Timothy showed his strength over the final lap and as other athletes faltered he strode powerfully on to finish in 30:52, nine seconds clear of the runner up. This continues the excellent preparation for Timothy as he builds towards the World Cross-Country Championships which will be held in his native Uganda in 2017. On the roads several PACE athletes participated in the traditional Thanksgiving Day races in the US. Leading results came from Chris Thompson (GBR) and Jordan Hasay (USA) both of whom competed in high quality races in Manchester, Connecticut. Both finished in third places in their respective male and female events, once again confirming the good form they are in.